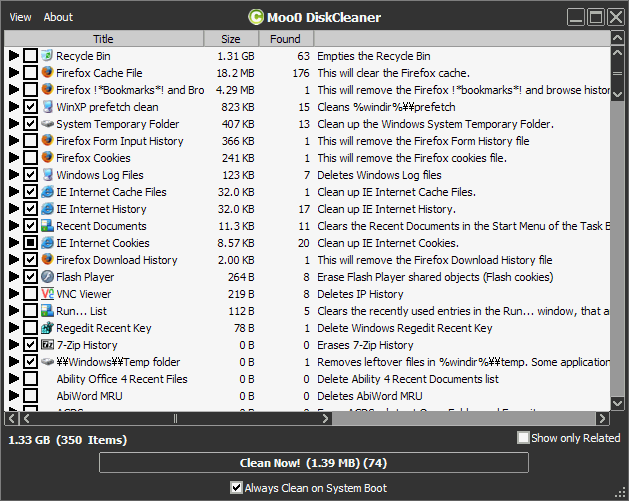 Moo0 Disk Cleaner lets you easily clean up unwanted files / data off your HDD. It is very easy to use, and you just need to check items you want to clean and press "Clean Now" button. It currently supports over 130 kinds of targets, including system temporary files, private data in registry, internet browser cache, history and cookies (IE, Firefox, Opera), and so on. You can also set it to automatically clean them whenever your system boots up.